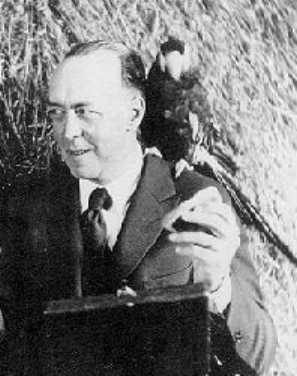 Edgar Rice Burroughs (September 1, 1875  March 19, 1950) was an American author of numerous pulp fiction heroic adventures. The most famous are Tarzan, set in Darkest Africa, and John Carter of Mars, but other lands are used: jungles and islands thoroughout the world, Venus in the Amtor series, and the hollow center of the earth Pellucidar, one of several literary examples of the Hollow World. Most definitely not to be confused with William S. Burroughs.note Unless you're Philip José Farmer, who wrote a Burroughs+Burroughs pastiche. Action Girl: His heroines never lack pluck, and while not the fighter the hero is, they often can weigh in on a fray. All Cavemen Were Neanderthals: Averted in The Eternal Lover (aka The Eternal Savage); Nu and his people live in caves, but they appear to be modern humans. Artificial Gravity: Beyond Thirty, a.k.a. The Lost Continent, is set in the 22nd century, and the protagonist starts out traveling on an airship lofted by anti-gravity. Birthmark of Destiny: In The Outlaw of Torn, Norman of Torn has a lily-shaped birthmark on his right breast, which eventually proves that he's Prince Richard, lost heir to Henry The Third. Blue Blood: Constantly. A hero, or heroine, not of Royal Blood is at least this. Cannot Spit It Out: All over the place. Jason Gridley is introduced in Tanar of Pellucidar, meets Tarzan in Tarzan at the Earth's Core, appears in A Fighting Man of Mars, and is mentioned in Pirates of Venus. The novel The Eternal Lover (a.k.a. The Eternal Savage and Sweetheart Primeval). A cliff-dwelling warrior of 100,000 years ago, Nu, is magically transported to the present, falls in love with Victoria Custer of Beatrice, Nebraska, the reincarnation of his lost lover Nat-ul, and the two are transported back to the Stone Age. The short story "The Resurrection of Jimber Jaw" features an unfrozen caveman with politically uncorrect views. Contemptible Cover: It's worth noting that just having a Frank Frazetta painting on a book's cover is said to have sold a lot of books that might not have sold otherwise. Contrived Coincidence: His plots are stuffed with them. Culture Clash: An ingredient of a big percentage of Burroughs' books, especially in the Lost World and Planetary Romance stories. Dirty Coward: More than one of his villains. Frazetta Man: Burroughs' books are full of these guys. Appropriately, Frank Frazetta himself did a lot of his covers. Loincloth: The official dress code in many a Burroughs novel. Lost World: In Beyond Thirty, a.k.a. The Lost Continent, a group of shipwrecked American mariners in the 22nd century explore the savage lost continent of Europe. In this future history (the story was published in 1915), World War I never ended because eventually no organized government was left to make peace. The United States never entered the war, and in fact made laws forbidding any ship to cross certain lines of longitude (hence the original title). Love at First Sight: Common method of choosing a mate for a Burroughs hero. Love Hurts: Common result of choosing a mate for a Burroughs hero. Mama's Baby, Papa's Maybe: In Beyond Thirty, a savage tribe is advanced enough to recognize paternity, but matrilineal because of this trope, and not being advanced enough to pull off any monogamous marriages. Military Mashup Machine: The protagonist of Beyond Thirty (alternate title The Lost Continent) is the captain of a Pan-American Navy "aero-sub" — a submarine capable of Anti Gravity flight. Sadly, he doesn't have his vessel throughout most of the story, having been thrown overboard by a mutineer in the first chapter. Oblivious to Love: Your typical Edgar Rice Burroughs hero needs to be hit over the head with a club, several times, before he realizes that he has fallen in love with the heroine. Oh Wait, This Is My Grocery List: Happens to the Prime Minister in Minidoka: 937th Earl of One Mile Series M.
Rags to Royalty: The title character of The Cave Girl was a ship-wrecked child of Spanish nobility. Reading the Stage Directions Out Loud: The Prime Minister in Minidoka: 937th Earl of One Mile Series M.
Royal Brat: The Leper King Lodivarman in The Land of Hidden Men. Strictly Formula: Burroughs stuck, most of the time, to a formula plot. His occasional departures were often less successful. Whip Sword: The spear-whips in Minidoka: 937th Earl of One Mile Series M.